Mariner's Green Series appeals to your conscience - but what about your ears? An eco-friendly guitar with excellent electro sounds. Price; lack of any case; minor quality control niggles. For a number of years now, with MI industry elder statesman and acoustic aficionado Ken Achard at the helm, Mariner has pioneered the use of a wood called paulownia (pal-lone-e-ah). Indigenous to China, paulownia is particularly well suited to guitar making. From a sustainable, geographical and manufacturing point of view, it ticks just about every green box there is. Mariner's Green Series of guitars is split into three sections. The Vertys guitars range from £385 for a 'dry' dreadnought through to £479 for a Super Jumbo loaded with the Fishman Presys system. 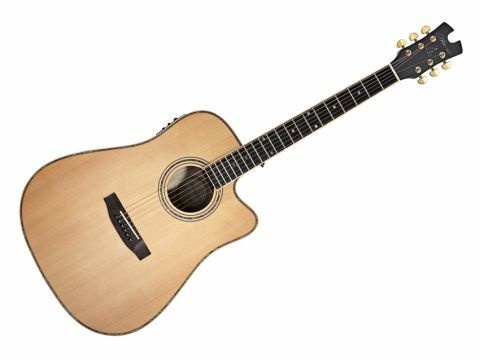 The Cutter range is Mariner's most affordable range, which currently consists of a parlour-style guitar priced at £325 - though word on the street is that new models could be arriving soon. The Eunoia guitars top the Mariner price list at £525 for the Fishman Presys Blend system OM and dreadnought guitars, although the OM is also available as a straight acoustic at £429. The Mariner Green Series guitars are all-solid wood affairs with both guitars' two-piece back and sides formed from paulownia. The Vertys models sport solid Sitka spruce tops, the Cutter solid cedar graded tops while the Eunoia models - such as the DEC reviewed here - boast premium grade solid Sitka spruce soundboards. Additional decorative features include the liberal use of abalone. It's fitted to the binding of the guitars' back and front, as a centre strip between the two-piece back and where the sides meet, within the soundhole rosette, as inlaid fretboard markers and to the heads of the bridge pins. Gold-plated tuners and hardware are also a welcome upgrade and, with on-stage duties in mind, it's good to see strap buttons fitted to the underside of the neck's heel. Mariner has in the past scored points for its green credentials; now it would appear they wish to widen the guitars' draw by appealing to the players' eye as well as to their conscience. Eunoia electros are fitted with Fishman Presys Blend electronics - an upgrade over the Vertys electros, which use the Presys + system. As its name would suggest, the Presys Blend incorporates both a pre-wired Sonicore undersaddle pickup (as fitted to Martin's X Series electros and many others) and an internal microphone - both individual signals can be blended. The Fishman preamp comprises low-profile rotaries and an LED tuner, which can be engaged whether or not the instrument is plugged into a cable. The nine-volt battery is housed underneath the control panel, which pivots to facilitate access. Quite clever in theory but, as soon as you let go of the housing, it slams shut! This can be frustrating and battery changing is not recommended mid-gig. Though positioned at the lower end of Fishman's range, the Presys Blend system still has a lot to offer. In addition to the centre-indented rotaries for the bass, mid and treble, the features include a notch filter to control unwanted feedback, and a phase push-button. The DEC is, as you would expect, a dreadnought electro cutaway. Though adorned with an increased level of decoration when compared with other Mariner Guitars, the Eunoia remains tastefully simple and uncluttered. Alas, close inspection of the guitar's innards is a little disappointing. Gauze netting, which is glued over bracing joints, is left looking unfinished, blobs of excess glue are apparent in many places and the internal kerfed linings could have been cut with more accuracy. While these lapses in quality control may not bother most potential purchasers and are of course unlikely to affect the guitar's tone by any discernible degree, we still feel it's a shame. Under direct comparison with the presentation of £500 guitars from Freshman, Tanglewood, Farida and Faith, for example, the Mariner could be finished to a higher standard. That said, overall, the guitar does feel strong, well-built and ready to handle all the rigours of live performance. Paulownia has a very distinct tone; one which takes a little getting used to. Though veering toward mahogany rather than rosewood in the tonal spectrum, the DEC's tone is very different to either - not better or worse, just different. Perhaps best described as 'woody', the DEC offers a dry but full output, with plenty of midrange. Played alongside a mahogany back and sides Freshman Apollo 3 DC (£499) the Mariner sounded thinner in the upper registers, though comparisons with volume and sustain were favourable. Plugged in, the DEC comes to life: the amplified tone is fuller, rounder and has more character. With minimal EQ fiddling, we found likeable sounds suitable for all playing styles and disciplines. The blend control offers a good degree of tonal shaping. Care is needed as we found the DEC to be prone to feedback when the mix was all-microphone (far right sweep) - despite the best efforts of the notch filter. What the DEC lacks acoustically is more than compensated for by its electro performance.